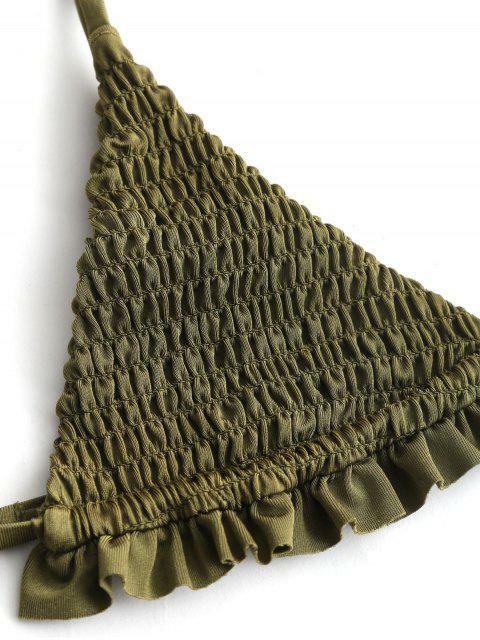 [44% OFF] 2019 Ruffles Bralette Smocked Bathing Suit In ARMY GREEN | ZAFUL ..
Igual que las fotos! La cobertura está perfecta solo que el tirante un poco flojo (no tiene de donde ajustarse) pero de ahí en fuera WOW, es de mis trajes favoritos hasta ahora. The bathing suit is beatiful, I'm size L, but since I saw in the comments that the bottom came small I ordered an XL, still small, still Love it! Look at this minimal bikini swimwear, it's full of alluring and charming style. Distinctive elastic smocked texture with frilled hem for a unique look. Fixed cami straps with a swan back closure detail for a constant effect. The swim bottoms with little coverage.